Summer visitors to our Fair Oaks Horticulture Center water-efficient landscape will find many hardy shrubs, blooming perennials and shimmering grasses that do well in the Sacramento area with less water while attracting bees, butterflies, birds and other beneficials. From bright red salvias, orange hummingbird plant, yellow sunflowers and black eyed susans, purple bluebeard and ruellia, dynamite red crape myrtle, gray-green foliage and ripening berries along with waving, shimmering ornamental grasses of all shapes and sizes there is a profusion of colors and choices for all tastes. Below is a list of a few of our hot weather favorites that grow well for us in the Fair Oaks Horticulture Center garden. For more information about what’s going on at the Fair Oaks Horticulture Center, please visit Water-Efficient Landscape Gardens. To learn about the UC Davis Arboretum All-Stars, many of which can be seen at the WEL gardens, go to UC Davis Arboretum All Stars. 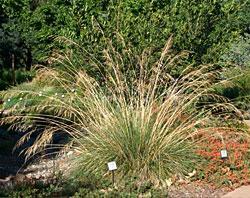 A medium size native perennial warm season grass, blue grama grass retains a tidy upright shape even when winter dormant. Charming eyelash flowering stalks 1 to 2 feet tall fade from light green, to tan, to light beige throughout spring to fall. Once established in full sun or part shade it can tolerate foot traffic, mowing and can be used as a lawn substitute. It is very drought tolerant. If planted as an accent or perennial companion plant, it should be sheared back in mid winter to renew. 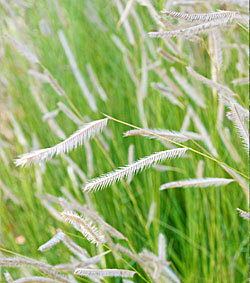 See the Ornamental Grass Environmental Horticulture Note (pdf) for more information on growing and maintaining ornamental grasses in the Sacramento area. Native to Asia. 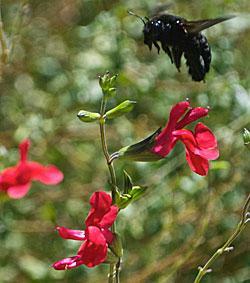 A bee and butterfly favorite, this low-growing, deciduous, mounding, small shrub grows 2 to 3 feet high and wide. It looks best planted in groups of 3 to 5 plants in well drained soil or raised beds. Flower cluster colors range from violet, to dark and light blue depending on variety. Bloom occurs from midsummer to frost. Flowers form on new wood, so prune nearly to the ground before spring growth begins. Trim off spent blossoms to prolong bloom. Prefers full sun and moderate water. The desert willow is a fast growing deciduous multi-stemmed tree native to the southwest United States and northern Mexico. This sun lover with lovely bicolored pink and burgundy flowers that bloom from spring to fall is a “show stopper” at the entrance to the perennial walk during our August Harvest Day event. Hummingbirds and bees are attracted to the prolific blooms. Timeless Beauty is a sterile variety that does not set seed and blooms over a longer season (spring into fall!) than varieties that do set seed. Named for willow-like leaves, it can grow to 18 feet tall and 15 feet wide in well drained soil. This native of Uruguay is an amazingly durable and long blooming perennial plant. Summertime clusters of bright orange-red flowers can be up to 2 feet tall, and the mounding plant may reach 3 feet across. Stems and leaves are covered with velvety gray felt which makes a dramatic setting for the tubular flowers (beloved by hummingbirds) are produced summer into fall. Preferring full sun and good drainage, the plant is not picky about soil types. (Ours is planted on a slight slope to improve drainage). It dies back in winter but regrows in spring (a good choice for areas where spring bulbs can take center stage before the hummingbird plant comes back to life). An easy-to-grow California native that tolerates heat, drought and poor soils (although it prefers good drainage), the California fuchsia welcomes bees, hummingbirds and beneficial insects to our garden. It is available in many varieties from aggressive mat-forming ground covers to 3 to 4 foot subshrubs with tubular blossoms of white, pink, orange and red and narrow to broad leaves ranging from gray to lime green. 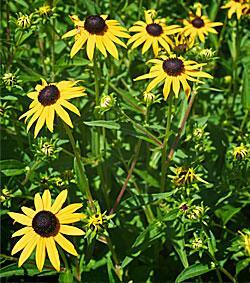 Once established the plants should be cut to the ground in late fall after blooming ends. We have several varieties growing in our garden. Near the entrance is the low growing gray, round leaved Epilobium canum ‘Calistoga’. Along the dry creek bed at the back of the common variety area is a taller growing, bright green leafed variety, while the entrance to the native garden is graced by a similar, but lower growing groundcover variety. A UC Davis Arboretum All-Star selection. 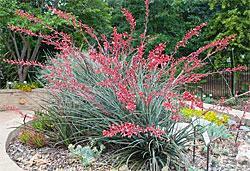 Just inside the entrance gate to the Horticulture center garden, a visitor first sees the glorious Hesperaloe parviflora, or coral yucca, growing in the center planter. Its clusters of rose-pink flower stalks arch up and outward like fireworks just in time for the 4th of July. Native to the Chihuahuan desert of west Texas east and south into central and south Texas and northeastern Mexico around Coahuila, the coral yucca has become popular throughout California and the Southwest. Some of its qualities include drought tolerance, heat resistance, low maintenance needs, hummingbird-attracting flowers, and an architectural form. In addition, it has few disease or pest problems. Hot summer bloom in full sun, striking bark, fall color, attractive to beneficial insects, hardy in winter, low to moderate water users, these small trees and shrubs are widely planted in Sacramento and for good reason. They do really well here. Recent hybrids introduced by the U.S. National Arboretum have been selected for hardiness and mildew resistance. Many of these have Native American names such as ‘Zuni’, ‘Arapaho’ and ‘Hopi’. Our two selections, ‘Catawba’ shown here and ‘Dynamite’ were selected for their size (up to 20 feet), bright summer bloom and orange-red fall color. Blooming on new wood, they are often pruned back in winter or early spring to control growth and promote abundant flowering. 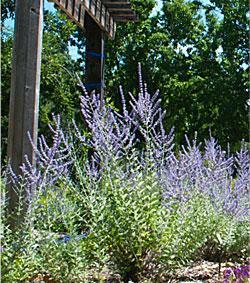 While most perennials are tired and defeated by hot, summer days, Russian Sage injects pure adrenaline into a garden. 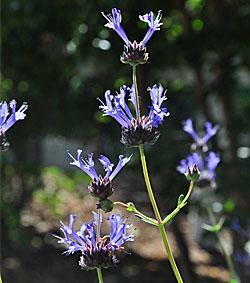 Its lavender-blue flower spires float like a mist over grey-green foliage from mid-summer until late fall. Despite its name, this long-bloomer isn't native to Russia, but to several countries in central Asia. That may explain its toughness. Deer and pest resistant, Russian Sage welcomes poor, well-drained soil, is drought tolerant once established, and needs scant maintenance. Prune it back to 4 to 6 inches in February and it's good to go for another year attracting bees, butterflies and perfuming the garden. Taller cultivars like 'Blue Spire' (3 to 4 feet tall) can flop, especially if over-fertilized or are subject to overhead watering. There are shorter cultivars, like 'Little Spire' and 'Peek-A-Blue' that are 2 feet in height. 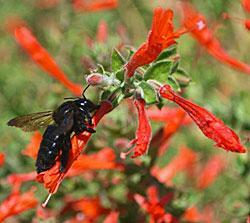 Russian Sage can be moderately invasive. Mature plants send out rhizomes and plants emerge 2 to 3 feet from the mother plant. Dig them out or give the plant lots of space. Pomegranates, natives of Northern Africa, Afghanistan, Iran, and the Himalayas, have been in California since the 1770s. Featured at the entrance to our "commonly available plants" garden, this dwarf variety blooms from spring to fall. Small fall-ripening fruit is primarily decorative. Mostly evergreen here, it will lose its leaves if frosted. It tolerates many soil types including alkaline soils, as well as heat and cold. 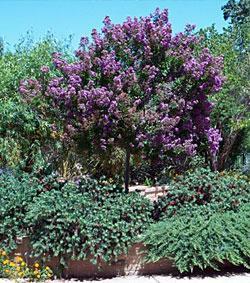 It is drought tolerant and makes a good foundation shrub, hedge, accent or small tree. ‘Nana’ grows to 3 feet high by 6 feet wide. 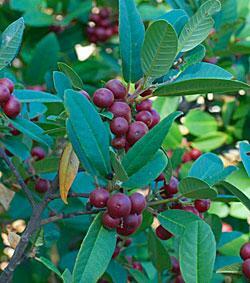 This evergreen native shrub of the California coast from Oregon to Baja adapts well to our Sacramento soil and climate. The olive green leaves are held by burgundy stems which bear yellow green spring flowers that provide nectar for pollinators. Berries, colored green to red then black through fall, provide food for birds and other wildlife. ‘Eve Case’ will grow in sun or part shade and while it prefers good drainage, it grows well in our clay soil. It is a good choice for a foundation shrub or hedge. In Sacramento, it grows 6 to 8 feet high and wide. It tolerates selective pruning. These brightly blooming sun loving descendants of eastern American natives signal that summer has arrived. Massed along our perennial walkway, they bloom from June through September, especially if spent blooms are removed. Dying back to the ground each winter, they re-emerge in the spring from spreading roots that need to be divided every few years. Easy to grow and tough, they do better with moderate watering. Bees, butterflies and other beneficial insects adore them. 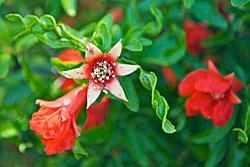 These California native, sun loving, small evergreen shrubs grow 3 to 5 feet tall and 5 to 8 feet wide. Brilliant blue-violet flower whirls on maroon colored stems appear from spring to early summer. Flowers invite hummingbirds, butterflies and beneficial insects to visit, and make attractive dried flowers. A member of the sage family, it has an easily recognized aromatic fragrance when the leaves are bushed lightly. Heat and drought tolerant once established. 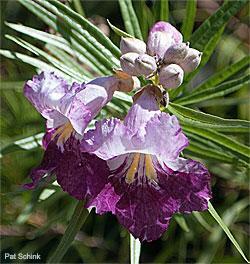 ‘Winnifred Gilman’ is a UC Davis Arboretum All-Star. Commonly called Autumn sage, these evergreen members of the sage family with charming red, pink, red and white blooms (depending upon variety) start blooming in spring and often bloom non-stop through fall, especially if spent flower stalks are pruned back. They typically grow 1 to 4 feet tall and wide. 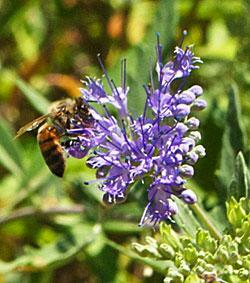 If properly sited in full sun or part shade, they are practically "goof proof," easy care, drought tolerant plants that attract hummingbirds, bees and other beneficial insects. They can be pruned in late winter to keep compact. Solidago hybrid ‘Golden Baby’, a low maintenance goldenrod perennial along with its close hybrid relative, Solidago californica ‘Cascade Creek’, makes a cheery addition to the summer perennial pathway. Growing to 2 feet tall, 18 inches wide, it starts blooming in June and continues throughout our long hot summer continuously into fall attracting bird and butterflies. A tough plant that thrives in any soil type, it can take part shade and moderate to occasional water. Cut to the ground after bloom has ended in the fall. 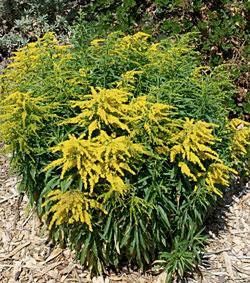 We don’t recommend planting the parent native goldenrod, Solidago californica, because it grows taller and can be invasive. Solidago californica ‘Cascade Creek’ is a UC Davis Arboretum All-Star. Giant feather grass is a dramatic ornamental grass with arching, feathery flower stalks reaching 8 feet from a base plant of 2 by 3 feet. It creates a shimmering focal point in the garden, especially when backlit. Originally from Southern Europe and Northern Africa, it is easy to grow and starts flowering in May. Low maintenance--it only requires removing spent flower stalks in late winter. 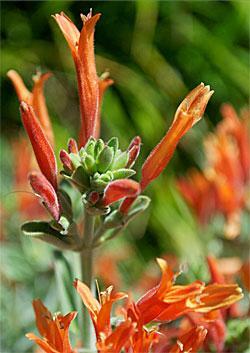 It grows in full sun or part shade and in a variety of soil types but is happiest in well-drained soil. A UC Davis Arboretum All-Star. 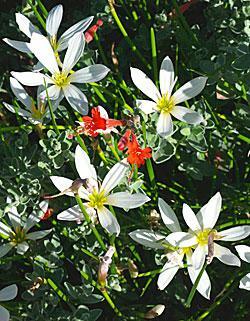 Also known as an Argentine rain lily, this cheery white flower blooms in late summer. Growing from bulbs that form small clumps of low growing shiny, grassy leaves it makes a good edging plant or groundcover. Once established, they require little water or pruning. Preferring full sun, it will handle small amounts of shade. Zephyr flowers also grow well in pots. Here it is pictured with another late summer bloomer, a low growing California Fuchsia.